Published: March 4, 2013 at 02:12 p.m. Updated: March 4, 2013 at 08:19 p.m. The highest-paid player in the NFL stepped to the podium in a zip-up jersey and a T-shirt underneath. If you expected Baltimore Ravens quarterback Joe Flacco to be outwardly affected by his new contract, well, you don't know Joe Flacco. 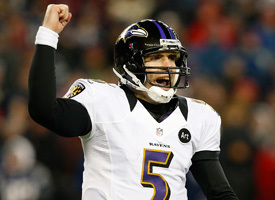 "It was pretty uneventful, to tell you the truth," Flacco said Monday of signing the contract. "It's not really a big deal. Our goal is to win the Super Bowl. That's always been one of my goals. It's never necessarily been a goal of mine to get paid like this. It's just what comes with the job." On one hand, Flacco can almost seem like he fell into such a big contract by accident. But then you see that he's a laid-back guy who firmly knows his value. Flacco was asked why he didn't sign a generous offer that the Ravens made a year ago. "Because I thought I was worth more," Flacco said. The way Flacco sees it, the new deal won't put more pressure on him. He thinks it was more pressure to play out his contract year without a title already in hand. That makes sense, but we suspect the criticism for his off days will be sharper now because of all the money. "It means a lot. It was never necessarily about the money. But it's definitely about earning that respect," Flacco said. Then again, Flacco isn't sad to see all that money. So, Joe, what are you going to do with all that money? "Just gonna look at it, I guess," Flacco said.